Everyone has that one friend or family member that’s impossible to shop for. Thankfully, there are plenty of awesome subscription box gifts that are perfect for almost every type of person. 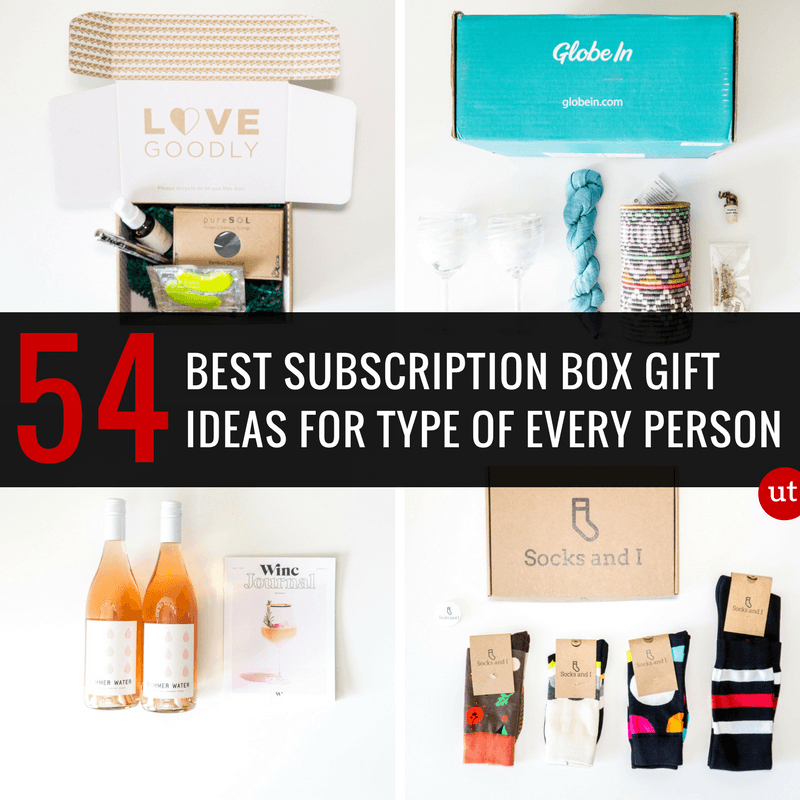 Whether if you’re looking for a subscription box gift for the holidays, a birthday, or just to show someone appreciation, there’s a box for that! Here are the best subscription box gift ideas that are the perfect fit for every type of person. From the wine-lover and healthy foodie to the fandom geek and DIY project enthusiast, there’s a box for them. Plus, we even have some exclusive coupons that you can’t forget about. How much it costs: Membership is free with wine starting at $13 a bottle. What’s inside: When you answer 6 questions about the flavors you love, you’ll receive curated wine selections based on your palette delivered straight to your door every month. How much it costs: $26.99 a gift box. What’s inside: With Loot Crate, each box contains a curated collection of awesome fandom items like apparel, comics, collectibles and so much more from your favorite geeky franchises. What’s inside: Stylists pick out the latest pieces based on your personal preferences and give you 48 hours every month to see your box selections and make any changes. Then once you receive your clothes box, you only pay for what you keep and get member’s only pricing of up to 25% in savings. You can skip any month at no charge and cancel anytime. Great for both men and women! How much it costs: $19.99 a month to $27.99 a month. What’s inside: With Candy Club, you’ll get delicious sweets and candies delivered straight to your door every month. This is literally the best candy box you can get your hands on. It’s insane. What’s inside: When you join FabFitFun, you’ll receive a seasonal box of full-sized premium beauty and cosmetic products as well as other great stuff. What’s inside: Get delicious, gluten free, organic goodies delivered straight to your home each month. Plus, there’s even a vegan snack box! What’s inside: With Blue Apron, you’ll get a meal box of original and seasonal recipes as well as super fresh, pre-measured specialty ingredients every week curated by renowned guest chefs and Blue Apron’s culinary team. What’s inside: Get 5 fantastic beauty samples based on your beauty profile and preferences each month. What’s inside: Get their famous coffee and espresso delivered monthly. Best of all, you can try it for free today! Coupon / Buy Now: Get your free sample today HERE. How much it costs: Choose between 4, 6, 9, or 12 meals starting at $49.99 a week. What’s inside: With Freshly, you’ll get chef prepared, healthy gourmet foods delivered weekly. Best of all, Freshly only uses the freshest ingredients free of any refined sugar, artificial ingredients, and gluten. This is also one of our top picks for college students! How much it costs: $29.99 every other month. What’s inside: Get full-sized, non-toxic, healthy, natural, vegan, and cruelty-free beauty products delivered straight to your door. Coupon / Buy Now: Use the code LOVEURBAN to get a free gift as well as save $5 when you join HERE. How much it costs: $11.99 a month for one pair. What’s inside: Get stylish, fun, and colorful brand-name socks delivered month. You’ll get popular socks from companies like Stance and Happy Socks just to name a couple. What’s inside: Get 5 beauty products based on your beauty profile and preferences. By far one of our favorite boxes for teens and tweens. What’s inside: Get 1 or more books of your choice based on your genre preferences delivered straight to your door month. How much it costs: $14.98 a month. What’s inside: Get a box of 3 full sized cleaning products that you can choose from over 75 options each month. Perfect for anyone looking to keep their house clean. How much it costs: $20 for 3 months. What’s inside: Get a box of some of the best healthy and workout supplements as well as premium samples of products that range from sports nutrition, sleep aids, gym gift cards, fitness videos, and more. Plus, there’s even a box strictly for weight loss products. How much it costs: $34.99 bimonthly. What’s inside: With the only official Harry Potter subscription box, you’ll get 5-7 exclusive and officially licensed items. To get started, just choose your House and your shirt size and you’ll receive a newly themed Harry Potter crate every other month. What’s inside: A great subscription box for kids ages 5-8 that love arts, crafts, and science. Inside each box, you’ll get high quality materials and kid friendly instructions where your child can learn how to build something great while learning the science behind it. How much it costs: $20 styling fee plus the cost of the clothes. What’s inside: With Stitch Fix, you’ll get 5 pieces of clothing, shoes, and accessories to choose from based on your personal style. Then from there you keep what you like and return the rest. You’ll only be charged for only what you keep. Plus, the styling fee goes toward the cost of your clothes. What’s inside: Each month, you’ll get a box of 3 to 5 cool and innovative outdoor gear as well as some of the latest and greatest in outdoor lifestyle apparel, skincare, food, emergency medial products, and much more. How much it costs: $19.50 a month. What’s inside: Get 16-20 delicious snacks all of which are either organic, all-natural, gluten free, or GMO-free. Plus, with each box purchased, Love with Food donates 2 meals to hungry children in America. Coupon / Buy Now: Get some stickers HERE. What’s inside: In each Teabox, you’ll get incredibly fresh tea chosen to match your tastes based on your palette quiz. Best of all, each box can make 120-150 cups of tea! Coupon / Buy Now: Get your tea HERE. How much it costs: $10 – $20 a month. What’s inside: With each Vellabox, you’ll receive a high quality lead-free, hand poured candle and free gift that complements your candle each month. Coupon / Buy Now: Start burning HERE. What’s inside: Each month, you’ll get a curated package of 3 clothing items based on your style preferences. Perfect for guys! How much it costs: $1 for a free sample box then $12 a month. What’s inside: In each Graze box, you’ll receive an assortment of healthy and delicious snacks free of any high fructose corn syrup, artificial flavors, or genetically engineered ingredients delivered straight to your home or office each month. How much it costs: $19 – $39 a month. What’s inside: Inside each Bokksu box, you’ll get 18-20 handpicked premium snacks that people in Japan actually eat. Best of all, all of the treats are sourced from snack makers in Japan meaning that most of the artisanal treats included in your box can’t be found anywhere else. Our favorite Japanese snack box! How much it costs: $139 a month. What’s inside: Get unlimited access to luxurious designer dresses, accessories, skirts, tops, and more worth up to $40,000 each year. Coupon / Buy Now: Use the code FIRST to get 20% off your subscription HERE. How much it costs: $28 a month. What’s inside: Inside each box, you’ll get 5 to 6 stylist picked items like ties, socks, pocket squares, grooming products and more. This is also a great subscription for Father’s Day! How much it costs: $29.95 a month for a 60 day supply. What’s inside: With BioClarity, you’ll get cruelty-free, vegan, and healthy products part of a 3 step process to get healthier, acne-free skin. How much is it: $129 – $159 every quarter. What’s inside: Get high-end products centered around tech, fitness, and other lifestyle essentials delivered straight to your door in a custom made wooden box every quarter. Coupon / Buy Now: Use the code UTB to get $15 off HERE. What’s inside: Get a pair of fashionable leggings delivered straight to your door that are perfect for yoga, hiking, and going out. Coupon / Buy Now: Get some leggings HERE. How much it costs: $14.95 to $45 a month depending on your plan. What’s inside: Get seasonally-appropriate certified organic, non-GMO garden seeds and planting instructions delivered each season. You can choose between two different boxes – the PlowBox Green which contains micro green seeds that you can use to grow nutrious greens year-round indoors or the PlowBox which sends you new seeds 4 times a year. Coupon / Buy Now: Start gardening today HERE. How much it costs: $18 – $23 a month. What’s inside: Get essential golf equipment like golf balls, gloves, tees, and more delivered monthly. Makes a great Christmas present too! Coupon / Buy Now: Get the golf box today HERE. How much it costs: $32 a month plus $6 for shipping. What’s inside: Get a tailored athlete box of awesome Crossfit and workout gear every month. What’s inside: Choose between a monthly scrapbooking kit, a documenter kit, a planner kit, or a stamp subscription. This is also a cool box for Mother’s Day. Coupon / Buy Now: Get your kit HERE. How much it costs: $20 -$48 a month. What’s inside: Inside each box, you’ll get an assort of 3 to 4 delightful goodies from the most magical place on earth. One of the coolest Disney boxes out there. How much it costs: $14.95 a month. What’s inside: Each month, you’ll get 3 handpicked bracelets from Pura Vida’s newest and most popular collections. Great for men and women! How much it costs: $1 – $9 a month. What’s inside: Get super affordbale, yet high-qulity razors every month. Just choose from 3 different razors and how often you like them and that’s it. And if you don’t like razor bumps, there’s a shave club for that too. Coupon / Buy Now: Get your razors today HERE. What’s inside: Get a monthly flavor kit of 3 freshly made spices as well as globally inspired recipes customized to your diet. Coupon / Buy Now: Get your spices today HERE. How much it costs: $20 – $29 a month plus free shipping. What’s inside: A great monthly gift box for all dog owners! Inside every box, you’ll get a themed collection of 4 to 6 innovative toys and healthy dog treats. Just choose your dog size and that’s it! Coupon / Buy Now: Get $5 off your box when you join HERE. How much it costs: $19.99 to $29.99 a month. What’s inside: Inside each box, you’ll receive 4-6 high quality cat toys, as well as all-natural and healthy cat products. Just choose how many cats you have and that’s it. Coupon / Buy Now: Get your cat box HERE. How much it costs: $42 a month. What’s inside: Each month, you’ll get shipments of some of the best, most exceptional craft brews from across the country. What’s inside: Every month, you’ll be able to try delicious international snacks from a different country. Easily one of the best boxes you can join for under $20 a month. Coupon / Buy Now: Use the code URBANTASTEBUDS to get 15% off your first order HERE. What’s inside: In each box, you’ll find new goodies for mom and the munchkin. Perfect from pregnancy to preschool. By far one of the best boxes for babies. What’s inside: In each box, you’ll get new hot sauces and spicy foods delivered monthly. What’s inside: Each month, you’ll get a box of 4-7 tactical and survival gear, tools, supplies, and more. Definitely one of the best survival gear boxes available today! Coupon / Buy Now: Get your survival box today HERE. What’s inside: A great box of artisan goods and home decor items from remote artisans and farmers from around the world. What’s inside: With Scentbird, you’ll get a 30 day supply of any designer fragrance (over 450 to choose from) delivered in a cool mini spray bottle. This is also a great box for students who want to smell fresh throughout the school year. Coupon / Buy Now: Get 25% off your box when you use the code SCENT25OFF when you join HERE. How much it costs: $14 – $24 every month. What’s inside: Get vibrant comfortable underwear for both men and women delivered straight to your home each month. Coupon / Buy Now: Get 20% off your underwear subscription purchase HERE. How much it costs: $29 for the first month. What’s inside: With Vinebox, you’ll get hand-selected wines by the glass delivered straight to your door. Definitely makes a great gift for beginner wine drinkers. Coupon / Buy Now: Get your first month for only $29 HERE. How much it costs: $25 – $275 a month depending on watch class. What’s inside: With Watch Gang, you’ll get a new watch from a different luxury watchmaker each month that’s yours to keep. And depending on which watch class you subscribe to, watch values range from $50 – $1500 MSRP. Plus, every Friday, a random member has a chance to win a Rolex. Talk about insanity. How much it costs: Prices vary depending on the box and the fish you’re trying to catch. What’s inside: With this fishing box, you’ll get some pretty cool and effective baits based on the fish you’re trying to catch. What’s inside: Get barbecue sauces and rubs by Myron Mixon delivered straight to your front door. Coupon / Buy Now: Join this great BBQ subscription club HERE. How much it costs: $37.50 a box. What’s inside: In every SaloonBox, you’ll get artisan cocktail ingredients curated by some of the best bartenders in the world. Plus, in each box, you’ll get all the essentials to make 2 different cocktails, both of which are for 2 people. What’s inside: Get awesome and unique phone cases delivered straight to your door every month. What’s inside: Get faith-inspired products that do good and respect God’s creation such as Faithbox’s monthly devotional filled with inspirational content for each day. Plus with every Faithbox shipped, they’ll provide 3 meals to hungry kids at Christian orphanages. How much it costs: Prices start at $40 a delivery. What’s inside: With a Bouqs flower subscription, you can get customizable fresh flower deliveries as often as you want. Plus, you can schedule deliveries throughout the year based on upcoming birthdays, holidays, after payday, or special occasions. Coupon / Buy Now: Join Bouqs HERE. What’s inside: Every month with a The Teacher’s Crate subscription, you’ll receive a box of 6+ fun, creative, and amazing products that will enrich your overall teaching experience. A great box for teachers! What it costs: $30 or $50 every month or quarter. What’s inside: With an Apollo Surprise Box, you’ll get unique and fun products tailored to your lifestyle and taste. Best of all, inside each box, you’ll be the first to try trending and creative products that are truly one-of-a-kind. What it costs: $1 a month. What’s inside: Get 3 new loose leaf tea blends along with tea filters that you can sample and enjoy every month. Best of all, each subscription can make 6 to 8 cups. Plus, with your first order, you’ll get a Honeystix! Please feel free to share our listing with anyone looking for awesome monthly subscription box gift ideas! Looking for more subscription gifts that aren’t boxes? Check our our top 10 faves!